A Porirua grandmother was beaten and throttled in her own home for half a packet of cigarettes and an iPad. 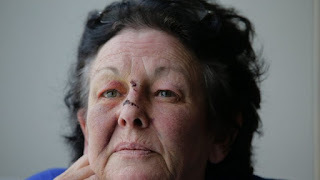 Linda McElwee played possum to survive the attack, which left her with scars and bruises to her face, chest and shoulder. "He tried to strangle me and then started bashing me with his fists and then an object. I knew I wasn't going to win a fight against him, so I played unconscious," the 63-year-old said this week. But despite her ordeal, in the early hours of May 21, she says she feels "a bit sorry" for her attacker and wants to see him rehabilitated. The sanctuary of McElwee's home in a quiet, bushy dead-end street in Ranui Heights was shattered when she awoke to find a stranger in the house. She thinks the deadbolt from the seldom-used sliding door in the lounge might not have been fully put back the last time it was used. "I had fallen asleep on my couch under a big fur blanket. The lights were on, the TV was on." The invader opened the sliding door and circled the couch, probably not spotting the sleeping McElwee, burrowed into her blanket. A packet of Winfield Blue 25s, holding 12 cigarettes and a lighter, and an iPad were taken from the coffee table. The burglar then headed for a small table at the foot of the couch, where a laptop was charging. "I woke facing the window and I noticed the curtain open. I made a slight move and he jumped me," McElwee said. "He came right down with his hands and then slammed his leg across the top of my shoulder and my chest, trying to pin me down. Then he got his hands around my throat. "I knew then this was for real. I started trying to protect myself and then he came on with his fists. "He must have thought the thumping wasn't doing any damage, so he picked up something solid and started bashing me around the face. "I realised this is getting serious and went limp." The invader made a run for it out of the door and into the darkness. McElwee's 83-year-old mother, who lives with her, slept through the entire episode. "Thankfully mum is deaf and slept right through it. I can only imagine what could have happened to her if she had wandered in while I was being attacked," McElwee said. Her mother said it was horrific to be woken by her daughter, her face covered in blood. "I thought I was dreaming when she woke me up and said, 'Mum, I've attacked.' Part of me feels guilty I slept right through it." McElwee, with blood pouring from her face and dripping on to the cream carpet, picked up the phone and called the police. Despite a good cleaning, the carpet is still visibly stained. Police were soon on the scene with the dogs, and McElwee said they tracked down a suspect just a few blocks away, having a smoke. A 17-year-old is due to appear in court on June 12. McElwee said: "I realise there are people struggling out there. It's sad to think they believe they have to resort to these kind of things. "This young person must have no self-worth, no self-respect and no pride. Hopefully the system can help give him these things."